WHAT HAPPENED: Anastasija Sevastova of Latvia, ranked No. 48 in the world, continues her career run here at the Open, taking out No. 13 seed Johanna Konta of Great Britain 6-4, 7-5 in Arthur Ashe Stadium. She moves on to the quarters, the first time in her career she's made the final eight of a major. It was the second major upset of the tournament for the Latvian, having also taken out No. 3 seed Garbiñe Muguruza in the second round. "It’s so tough to play, after these two matches," said an emotional Sevastova after the match. "I'm just fighting and fighting in my head." 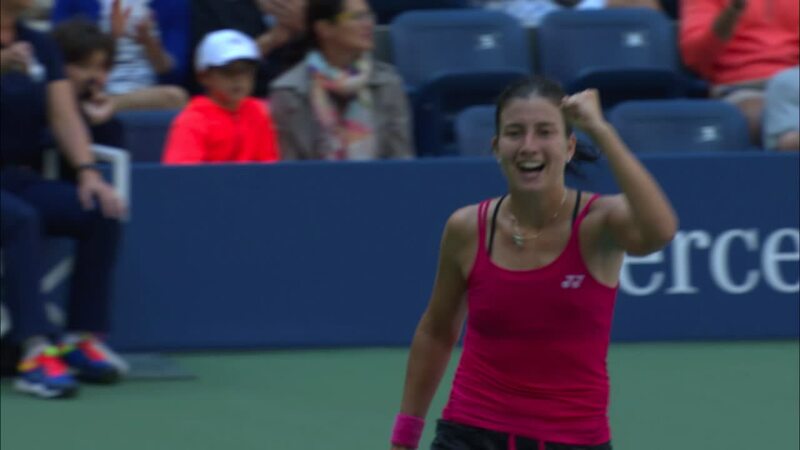 Sevastova is the first Lativan to reach a quarterfinal at a Slam since Larisa Savchenko reached the Wimbledon quarters in 1994. Just as noteworthy, Sevastova had actually retired from tennis back in 2013 due to a slew of injuries, and only unretired at the start of the 2015 season. "It was hard moments in 2013, I was injured on and off and it was hard to play," Sevastova said. "But now, I’m back." Konta was trying to reach the quarters at the Open for the first time in her career, having also lost in the round of 16 last year. She saved a match point in the second set with Sevetsova serving at 5-3, nailing a backhand cross court winner on the line. She saved a second match point in the tenth game while serving at 5-4. But after pulling even at 5-5, she couldn’t sustain the momentum. With Konta serving at 5-6, Sevetsova nailed two forehand winners to get to 15-40, and on her third match point sealed the deal off a Konta forehand error. Sevetsova used an versatile arsenal throughout the match, mixing in forays to the net and big ground strokes with slices and drop shots. Her crafty style seemed to throw off Konta’s rhythm, with the No. 13 seed hitting 34 unforced errors in the match, often at crucial times. Serving at 3-4 in the first, after having clawed back from a 0-3 hole, Konta hit three straight backhand unforced errors into the net to give Sevastova her second break and a 5-3 lead. Konta broke back to 5-4, but Sevastova, behind two screaming forehand winners up the line and a drop shot winner, broke yet again to take set one. WHAT DOES IT MEAN: This is a huge blow for Konta, 25, who had been on a roll on hard courts of late. She reached the semis of the Australian Open earlier in the year, becoming the first British woman to reach the semis of a Slam since 1983. She also finished second in the Emirates Airline US Open Series this summer, reaching the quarters at Montreal and winning her first WTA title at Stanford, defeating Venus Williams in the final. Because of her runner-up finish in the summer US Open Series, if she had won the tournament here she would have earned an extra $500,000 in prize money. Sevastova actually reached the second week of a major once before, reaching the round of 16 at the 2011 Australian Open. But after injuries forced her off the tour in 2013, this is clearly the pinnacle of her comeback so far. She next takes on the winner of the fourth round match between the No. 8 seed Madison Keys and Caroline Wozniacki, the two time runner-up here in 2014 and 2009. QUESTION: Is Sevastova’s crafty style of play likely to also throw off either Madison Keys or Caroline Wozniacki in her next match? September 4, 2016 - Anastasija Sevastova in action against Johanna Konta during the 2016 US Open at the USTA Billie Jean King National Tennis Center in Flushing, NY. September 4, 2016 - Johanna Konta in action against Anastasija Sevastova during the 2016 US Open at the USTA Billie Jean King National Tennis Center in Flushing, NY.